A dental implant is one of the most effective ways to replace a missing or failing tooth. It can take approximately 4- 9 months, from start to finish. At Studio Z Dental we work as a team with surgeons when we do implants. One fee will be from the surgeon for placement of the implant. A second fee will be from Studio Z Dental for the Implant abutment and Implant crown. On average, the total cost for a routine single tooth will be around $6000 between the surgeon office and our office. Many people know an implant isn’t cheap. When they see an offer for an “Implant Discount” at a dentist, it might seem like a good bargain. Or, they hope their insurance will cover the cost, but most will only cover a fraction. Let’s look at what’s involved in the implant process. Then you’ll better understand what this “Implant Discount” might cost you. Our dentists at Studio Z Dental work with highly skilled, experienced surgeons, as a team, in the implant process. Since we work with only the very best surgeons, you can feel confident this step will be as carefully done as any of our work. The “Implant Discount” will likely involve cheaper parts, cheaper labs and corner cutting. Step 1) Tooth is removed and bone graft placed by a surgeon. The bone graft allows the bone to heal at an appropriate level so that there is enough bone to support the implant. This will need to heal for three months. If it’s not done carefully, the bone might not heal properly. Step 2) Implant is placed in your bone by the same surgeon. Again, this will heal to the bone for a minimum of three months. In certain circumstances this can be combined with step 1. Step 3) When the implant has healed the surgeon will release you for the final restorative stage of the implant. We will then schedule you to check the implant and take a study model to make a custom impression tray for you. It will take about a week to make the tray. Step 4) You will return to our office for a final impression for the implant. At this appointment, we will remove the healing cap, place an impression post (given by the surgeon usually, and is not the final abutment), take an impression, and put the healing cap back on. The impression goes to our dental lab and they fabricate the implant abutment and crown. We use the best labs because they provide the highest quality abutments and crowns. A discount implant may use lower quality abutments and crowns, which can degrade faster. Many dentists use after-market discount implant parts. The discount implant may not be as precise of a fit for your mouth, causing irritation for the life of the crown. Step 5) One month later, return to our office for placement of the implant abutment and crown. 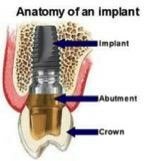 The abutment is screwed into the implant and the crown is cemented on. In this final stage, we very carefully take the time to ensure the perfect fit for your new crown. It will feel natural in your mouth because of the high quality materials used, precise impression of the old tooth to the new tooth and exacting placement of the new crown. Getting an implant crown is never a procedure anyone wants to have done over again because of poor quality materials, and lack of time spent by the surgeon or dentist, to do it right the first time. With Studio Z Dental, you know you’ll get the highest quality materials. Add to that, our highly skilled dentists and surgeons, you know it’ll be done right the first time.